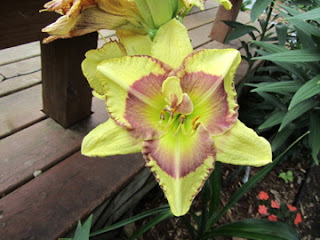 It's so much fun to go out to the garden lately, as every day a new daylily has opened up. I think of myself as a hosta person, but the more I dapple in daylilies the more I like them. Don't worry, my hostas are still staying number one on my list. 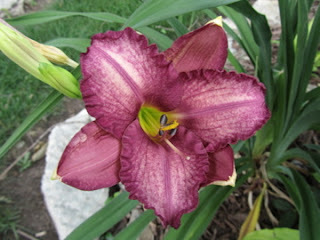 But how much fun is it to see a new flower bloom every day? Is is just me? My neighbors probably think I am crazy, as some mornings I am out with my camera while still in my pajamas. On Silken Thread - which is a spider type daylily because of the long petals. It's also known as a UFO or Unusual Form. Wow! Lovely lilies. My favorite is the lily on the second photo the "kisses like wine".